Ranging from 1500′ to 14,494′ in elevation, these adjoining parks protect immense mountains, deep canyons, huge trees, and stunningly diverse habitats. The Generals Highway climbs over 5000 feet from chaparral and oak-studded foothills to the awe-inspiring sequoia groves. From there, trails lead to the high-alpine wilderness which makes up most of these parks. Although they were created by separate acts of Congress, Sequoia and Kings Canyon share miles of boundary and are managed as one park. Sequoia was the second national park designated in this country. Human interactions with black bears, which inhabit all but the highest areas of these parks, can result in problems for people and bears. The Lodgepole Visitor Center provides information for visitors to Giant Forest and the northern section of Sequoia National Park, our country’s second oldest National Park. Giant Forest is one of the main visitor destinations in Sequoia. Four of the world’s five largest sequoias grow here, and scenic meadows dot the area. High ridges to the east of the area culminate in Mount Silliman and Alta Peak, both over 11,000′. Popular foot trails lead to glacial lakes, and a side road winds down to Crystal Cave, a beautifully decorated marble cavern. Seeing Giant Forest: General Sherman Tree: The General Sherman Tree is 274.9′ (83.8 meters) tall, and 102.6′ (31.3 meters) in circumference at its base. Other trees in the world are taller: the tallest tree in the world is the Coast Redwood, which averages 300′ – 350′ (91.4 – 106.7 meters) in height. A cypress near Oaxaca, Mexico has a greater circumference, 162′ (49.4 meters). But in volume of wood, the Sherman has no equal. With 52,500 cubic feet (1486.6 cubic meters) of wood, the General Sherman Tree earns the title of the World’s Largest Living Thing. 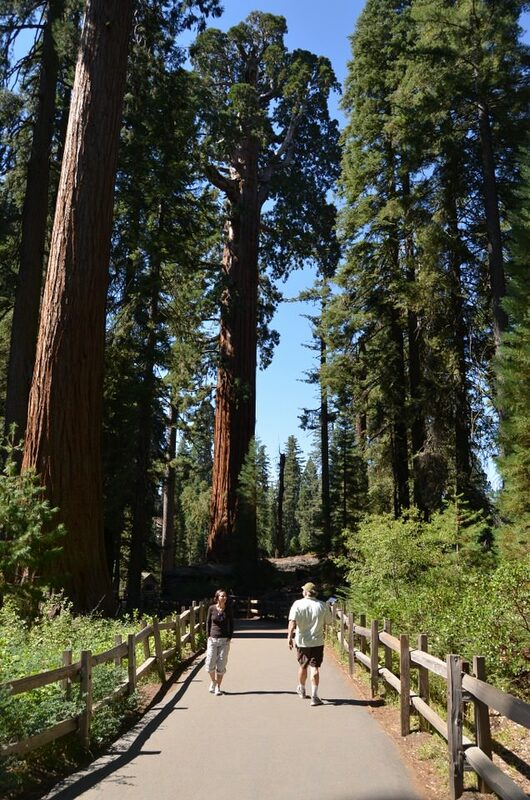 The Congress Trail: This 2 mile stroll begins at the Sherman Tree, and follows a paved trail through the heart of the sequoia forest. It is recommended for first-time visitors to the Giant Forest, and for visitors with limited time. Famous sequoias along this trail include the House and Senate Groups, and the President, Chief Sequoyah, General Lee and McKinley Trees. An informational trail pamphlet is sold at the Sherman Tree or at the visitor center book store. The Trail for All People: This paved trail begins adjacent to the Giant Forest Lodge, and forms a 2/3 mile loop around Round Meadow. Signs along the way describe forest and meadow life, and this sequoia-lined meadow is a good place to view wildflowers during the summer. Hazelwood Nature Trail: The Hazelwood Nature Trail begins on the south side of the Generals Highway, adjacent to the Giant Forest Lodge. Along this gentle 1 mile loop, signs tell the story of man’s relationship to the Big Trees. The Moro Rock-Crescent Meadow Road: The Moro Rock-Crescent Meadow Road leaves the General’s Highway from Giant Forest Village and travels for 3 miles through the southwest portion of the Giant Forest. It dead-ends at a trailhead and picnic area. This road is not recommended for trailers or RV’s. In the winter, the road is closed to vehicles, but open to cross-country skiing. Several famous attractions are located along this road. 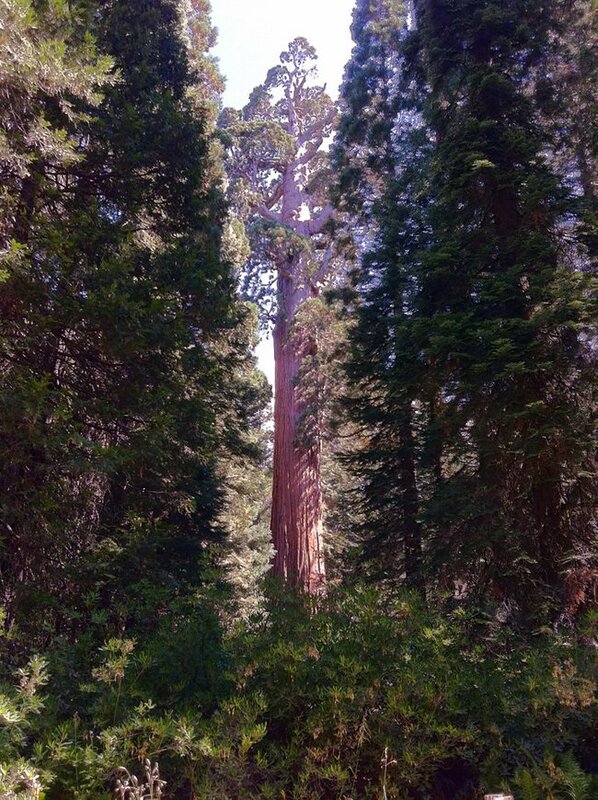 The Auto Log: Early visitors to the Giant Forest often had difficulty comprehending how big the giant sequoias are. To help give a sense of their size, a roadway was cut into the top of this fallen tree. The Auto Log is located 0.9 miles from Giant Forest Village on the Moro Rock-Crescent Meadow Road. Moro Rock: The parking area for Moro Rock is 2 miles from the village. A steep 1/4 mile staircase climbs over 300′ (91.4 meters) to the summit of this granite dome. From the top, you will have spectacular views of the western half of Sequoia National Park and the Great Western Divide. This chain of mountains runs north/south through the center of Sequoia National Park, “dividing” the watersheds of the Kaweah River to the west and the Kern River to the east. Also on the eastern side of the divide is Mt. Whitney, the tallest mountain in the lower 48 states. Unfortunately, because many of the snowcapped peaks in the Great Western Divide reach altitudes of 12,000′ (3657 meters) or higher, it is impossible to see over them to view Mt. Whitney from Moro Rock. The summit of Alta Peak, a strenuous 7-mile hike from the Wolverton picnic area, is the closest place from which to see Mt. Whitney. The Parker Group: The Parker Group is considered one of the finest clusters of sequoias which can be reached by automobile. It is 2.6 miles from the Giant Forest Village. The Tunnel Log: Sequoia and Kings Canyon have never had a drive-through tree. The Wawona Tunnel Tree, the famous “tree you can drive through”, grew in the Mariposa Grove of Yosemite National Park, 100 air-miles north of Sequoia and Kings Canyon. It fell over during the severe winter of 1968-69. Visitors to Sequoia National Park can drive through a fallen sequoia, however. In December 1937, an unnamed sequoia 275′ (83.8 meters) high and 21′ (6.4 meters) in diameter fell across the Crescent Meadow Road as a result of “natural causes”. The following summer, a Civilian Conservation Corps crew cut a tunnel through the tree. The tunnel is 8′ (2.4 meters) high and 17′ (5.2 meters) wide, and there is a bypass for taller vehicles. Crescent Meadow: The Crescent Meadow Road ends at a parking and trailhead area less than 100 yards (91.4 meters) from the edge of Crescent Meadow. A popular hike from Crescent Meadow is the 1-mile stroll to Tharp’s Log, a fallen sequoia that provided a rustic summer home for the Giant Forest’s first Caucasian resident, Hale Tharp. Another easy 1 1/2 mile trail circles the meadow, which is an excellent place to view wildflowers in the summer. Some lucky visitors to this and other meadows in the park may also have an opportunity to see a bear. Because Crescent Meadow is a fragile environment, please stay on designated trails and walk only on fallen logs for access into the meadows. 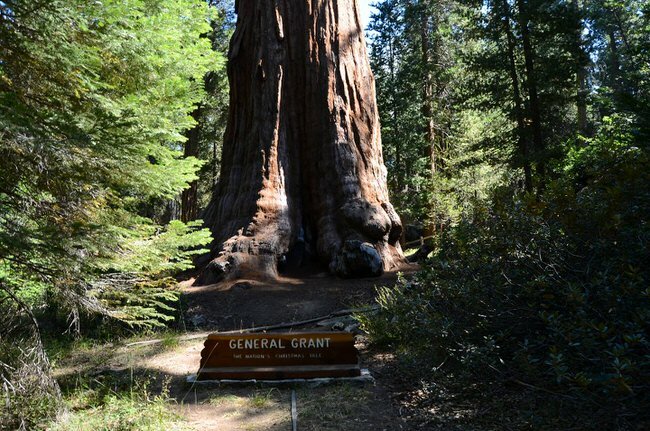 General Grant Tree: The General Grant is the third largest tree in the world and the Nation’s Christmas Tree. It has been designated a National Shrine, the only living memorial to Americans who died in war. Signs describe many of the features along this 1/3 mile, paved trail, including the historic Gamlin Cabin and the Fallen Monarch. You may also buy a more detailed trail booklet at the trailhead or visitor center book store. The trail begins 1 mile northwest of the visitor center. Take a virtual stroll along the Grant Tree Trail. Big Stump Basin: Imagine yourself in a noisy, bustling logging camp as you ponder huge sequoia stumps and other remains of Smith Comstock’s lumbering operation. As you walk this 1-mile loop through regenerating sequoia forest, shrubland and meadow, watch for birds and wildflowers. Purchase a trail booklet at the trailhead or visitor center book store. An alternate trail leads across the highway and past the Sawed Tree, a sequoia that survived being cut most of the way through over a century ago. Big Stump Basin is located 2 1/2 miles southwest of the visitor center on Hwy. 180. Panoramic Point: Treat yourself to a spectacular vista of the high Sierra. Identify peaks from Mt. Goddard in northern Kings Canyon Park to Eagle Scout Peak in Sequoia Park. Mt. Whitney cannot be viewed from the roads on the west side of the Sierra due to the height of the Great Western Divide. The 2.3 mile road to Panoramic Point is not recommended for trailers and RV’s. The viewpoint is a 1/4 mile walk from the parking lot. This road is closed to vehicle traffic in the winter, when it is available as a cross-country ski route. Hume Lake: Hume Lake was built as a mill pond, and to supply water for a flume that floated rough-cut sequoia lumber from Converse Basin to the planing mill at Sanger, 54 miles away. The lake is in Sequoia National Forest. During the summer, it offers fishing, swimming, boat rental (available through Hume Lake Christian Camps) and a Forest Service campground, as well as gas, groceries and a small laundry. Hume Lake is 12 miles north of Grant Grove. “A rival to Yosemite,” wrote John Muir, describing the canyon of the Kings River. This glaciated valley in which Cedar Grove lies presents travelers along the highway with towering granite cliffs, tumbling waterfalls, and a powerful river. Roaring River Falls: A refreshing and shady five-minute walk leads you to a forceful waterfall rushing through a narrow granite chute. The easy, paved trail begins at a parking area 3 miles east of the Village turnoff. Zumwalt Meadow: This one-hour loop trail, just over one mile long, is one of the most scenic in Kings Canyon. It affords magnificent views of high granite walls, a lush meadow, and the meandering Kings River. A booklet for the self-guiding nature trail is available at the trailhead. The trailhead parking area is 4-1/2 miles east of the turnoff to Cedar Grove Village. Grand Sentinel Viewpoint: Rising 3500′ above the canyon floor, Grand Sentinel is one of the most striking rock formations in the Kings Canyon area. The turnout, 5 miles from the Village turnoff and just east of Zumwalt Meadow, provides a clear view of the monolith. Motor Nature Trail: Giving visitors a feel for the first “highway” along the canyon, this 3 mile, rough dirt road provides a leisurely drive along the river. Please note that the Motor Nature “Trail” is a one-way, westbound road with a maximum vertical clearance of nine feet. It is suitable for cars and mountain bikes, but not campers, RV’s or trailers.